Shanghai Maglev Train (SMT) operats between Shanghai Pudong International Airport and Longyang Road Metro Station. With the technological cooperation from Germany, the world's first commercial magnetic levitation line was operated on Apr 1, 2003, the designed maximum operating speed of 430 km/h is near the flight speed, and the actual operating speed is about 300 km/h, the whole 30 km trip will take only eight minutes. Passeneger could change other transportations at Longyang Road Metro Station, such as subway line 2 or 7, taxi and public bus. 3.Single Trip: Passengers could take the train from Pudong International Airport or Longyang Rd Metro Station to another station. 4. Round Trip: Passengers could take the Maglev Train back and forth between Pudong International Airport and Longyang Rd Metro Station within 7 days. 5. Passengers could enjoy 20% discount to get one Single Trip Ticket for Economy with the air ticket of the same day. 6. Each adult can bring one child at or under 130cm free of charge. Children above 130cm shall buy the full-price ticket. Children at or under 130cm are not allowed to take the train alone. 7. Passengers could get the Maglev Train Ticket by Shanghai Public Transportation Card, and enjoy 20% discount to get one Single Trip Ticket for Economy. You could buy Shanghai Public Transportation Card from any Subway Train Station, the deposit is RMB20/per card. 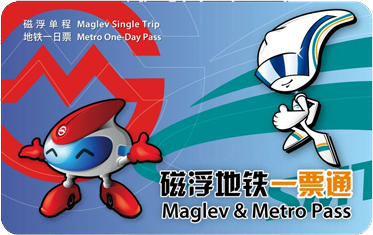 From May 23, 2013, Shanghai Metro and Shanghai Maglev launch a new product "Maglev & Metro Pass", it's the combination of "Metro Day Ticket" and "Single Maglev Ticket for Economy" or "Round Maglev Ticket for Economy", the price is RMB55 and RMB85. Passengers could buy the ticket from main metro station and two maglev stations. Passengers could take any times metro train and single/round trip maglev train for economy with 24 hours after first take the train. If you need transit in Shanghai Airport, and you have enough time, so you could take a Maglev Subway Day Tour by this card by yourself. Pudong International Airport, Longyang Rd. Line 2: Hongqiao Railway Station, T2 of Hongqiao Airport, Zhongshan Park, Jiangsu Rd., People’s Square, Jing’an Temple, East Nanjing Rd., Lujiazui, Century Ave, Longyang Rd. Line 7: Zhenping Rd., Jing’an Temple, Yaohua Rd., West Gaoke Rd., Longyang Rd. Line 10: Hongqiao Railway Station, T2 of Hongqiao Airport; South Shaanxi Rd., East Nanjing Rd.